How might a young ISIS true believer, back from Syria to the west, see the movement's future? Here, continuing a series of letters, is an imagined answer. 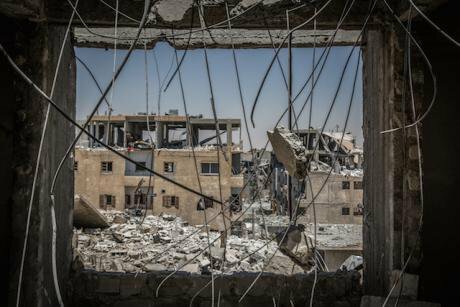 Raqqa, destroyed houses on the front line in the Al Dariya neighborhood, Syria, 24 July 2017.Morukc Umnaber/ Press Association. All rights reserved. Thank you for your letter and I am really sorry that it is seven months since I last wrote to you (see "Letter from London, not Raqqa", 4 November 2017). As you will have seen this is my second letter from London rather than from Raqqa, and the signs are that I will be working here for some months to come, perhaps even years. Thank you also for asking after my brother. I have not received news of him recently though I think I know where he will be going next. This is because I have heard from a reliable source that our leaders have decided to improve connections with our associates in Egypt as they work to extend our influence beyond Sinai where it is already strong. As you know, two of our current areas of expansion are the Sahel and Egypt and while progress has been good in the Sahel, Egypt is actually far more important. Abdel Fattah al-Sisi's dictatorship is so repressive and so determined to crack down on any kind of religious dissent that the reaction is already developing fast and much of it will benefit us. I am therefore told that my brother, with his huge depth of experience and rigorous commitment, will be deployed there and may already be there. Re-reading my last letter to you, I have to say that just about every indication of our future potential that I mentioned then still holds good. We are active in southern Thailand, the Sahel, the Horn of Africa, Egypt, Libya, and of course Afghanistan, we are regrouping in Syria and Iraq, and are more active in the western Gulf states than anyone in authority will admit. As I have said to you before, our leaders recognised within just a few months of liberating Mosul in 2014 that a fully survivable and expanding “caliphate” was simply not going to happen. Just the first few weeks of the airstrikes made that clear, so our preaching since then has made much of the symbolism of what we had achieved. You may argue that this is being wise after the event but do remember that the decision of our leaders to advocate and support attacks against the far enemy in his own lands came more than three years ago. This was in the full knowledge that the caliphate, even if short-lived in this manifestation, would live in the hearts of minds of our followers as proof of what could be achieved against the huge military power of the far enemy. I’d like to say more about this and our future plans but first let me bring you up to date on what I am doing here in London. As I said in November, our leaders have sensibly dispersed our intelligence and analysis sections, with a number of autonomous cells established across the states of the far enemy, especially in the UK and France. We are under strict orders to concentrate purely on research and analysis, avoiding anything that could be deemed even remotely questionable by the authorities. This does not mean that I am not ready for arrest at any time and I, like others working for our cause here, have already been trained in counter-interrogation techniques as well as the most effective ways of converting fellow prisoners once in jail. As you know, we have already had some significant successes in this direction and we see this as a key part of our work in the coming decades. Because I had lived in the UK when I was a student it was quite easy for me to return here as a refugee from Iraq and I now have safe status, sharing a large flat with some postgraduate students who are from across the Middle East and in no way connected with any movement such as ours. I didn’t mention it when I wrote to you in November but back then I had already enrolled on an MA course in security and intelligence studies at a university here and have successfully completed the taught parts of the course. The results are good enough to set me on the path to a distinction, so I am working in all my spare time to complete my research dissertation which I have to complete by the end of August. This is on the origins of ISIS in Iraq right back from the start of the far enemy’s Task Force 145 Special Forces operation in 2004, the attempt to crush the resistance, the mistaken belief that it had succeeded and the subsequent growth of our revitalised movement. 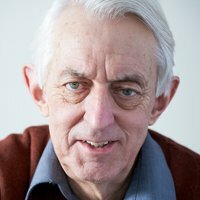 I obviously rely officially on published sources but I have been hugely aided by my language abilities since my English and French are fluent in reading as well as speaking, I can obviously read all the Arabic sources and know their nuances, and my more limited knowledge of Turkish and Farsi is also helpful. In addition I benefit from much personal knowledge so I am confident of a good result. This certainly gives me the edge over most students on the course which also has the advantage of being run by a very mainstream university department that has good connections with the major London security think-tanks. My thoughts, and those of our leaders, are that if people like me can continue our intelligence gathering while aiming for positions with these centres or with private security and intelligence companies then we will be tremendous assets to the movement. This takes me on to the wider issue since it should be obvious from what I have just said that our leadership and thousands of dedicated supporters across the world are engaged in a decades-long endeavour. Indeed, you asked me in your last letter why I felt to positive that our movement had a future, so perhaps I could go through some of the reasons. The first relates to the palpable anger and bitterness which permeates many of our younger supporters in countries like the UK and France as it does our supporters right across north Africa, the Middle East, and into south Asia and southeast Asia. This bitterness relates partly to the huge loss of life that we have suffered in the air war. The Americans claimed to have killed at least 60,000 of us directly in their airstrikes. Each person killed will have at least thirty more in their family or among their circle of friends, many of whom will be deeply angered by the loss. What makes it worse is that the leaders of the far enemy are quietly pleased with this harvest of life – they seem to regard it as their absolute right to come from their world to our world and kill us by the ten thousand. Extending from this first reason is the devastation wreaked on some of our historic cities, especially western Mosul and Raqqa. Many thousands of people were killed by air and artillery attacks on those two cities alone, with thousands of corpses still buried under the rubble. There has been little coverage of this in the media over here, but one of the great ironies has been that western charities such as MSF are bringing medical aid to the survivors and appealing for money for their work to the citizens of those very countries that did the killing and wounding in the first place. The latest MSF appeal here in Britain actually quotes a young A&E specialist working for them in Raqqa which, he says, “has been mostly destroyed, with vast swathes of the city razed to the ground. Everywhere you look are burnt-out buildings and rubble”. Talking of ironies, though, I am very pleased to tell you that I have been fitted with a prosthetic arm by the local NHS hospital here in London. I lost my arm in an attack by a Zionist drone and have had it replaced by the national health service of a country which is a veritable ally of the Zionists. Sometimes, in the midst of all the problems, you have a gloriously sweet moment – not exactly retribution, but certainly the next best thing! There are other reasons for our long-term expectations. When the so-called “Arab spring” started in 2011 our leaders were concerned that the non-violent overthrow of autocratic rulers kept in power by wealthy and corrupt elites would damage our cause. The argument was that the last thing they wanted was representative governance, accountable to the many millions of marginalised yet educated young people. While we knew this phenomenon would eventually fail, it would have been a thoroughly annoying diversion from the desperate need for a proper caliphate. We needn’t have worried, and Egypt became the classic example of how it was to turn out. Sisi and his like are all part of the neoliberal autocracies that run our world, with the supporting elites determined to hold on to their power and wealth. They seem to have no idea that they are sitting on a time-bomb of bitterness and resentment in the form of millions of educated young people on the margins, all too well award of the blatant injustice of the whole system, with many of them ready to be led to a better path. To all of this I must add one factor. You will recall when we first started this correspondence more than three years ago that our leaders insisted that people like me study the states and peoples of the far enemy, and my work has been mostly concerned with Britain and the United States. Having been back in the UK for several months I can see all too clearly that there are deep problems of insecurity and instability right across Europe and through to the US. Rampant xenophobia and Islamophobia are becoming the order of the day, exemplified by countries like Hungary and Italy determined to “close the castle gates” to protect them from those hordes of dangerous refugees and migrants. Look at Brexit as one response and then Trump and his actions against migrant children. Everywhere we see far-enemy states beginning to come apart, with their every weakness an absolute gift to us and our true mission. In short, the world is going our way and I have no doubt whatsoever that the caliphate will return ten times stronger. When and how, nobody knows, but that hardly matters. We are not in this for years or even decades. Our mission will go on for ever. Our enemies are doing exactly what we expected and what we want, and the remarkable element is that they have no understanding of this. Long may it last.